This may be hard to believe now, but back in 1999 the idea of building the country’s first soccer-specific stadium in Columbus was “a revolutionary concept,” said Andy Loughnane, Columbus Crew SC President of Business Operations. 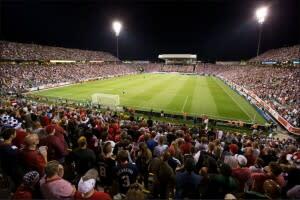 Major League Soccer has 13 soccer-specific stadiums, with four more on the way. The MLS and Crew SC have grown by leaps and goals, MAPFRE Stadium is a loud, packed and fun place to be and Crew SC is on track to set yet another attendance record this year. The USMNT will play Mexico on November 11 at MAPFRE in a televised game that millions around the world will watch. The USMNT Is 8-0-3 all-time at MAPFRE, including a 6-0-2 record in World Cup qualifying matches, and a 4-0 record against arch-rival Mexico in the final, Hexagonal stage of World Cup qualifying. 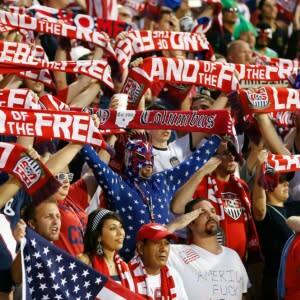 And the USMNT has won the four matches against Mexico by a 2-0 – Dos A Cero – scores before sellout crowds of about 25,000 red-white-and-blue wearing fans who left with hoarse voices and big smiles. “It’s a privilege bestowed upon us by U.S. Soccer to host this game,” Loughnane said. Loughnane came to Crew SC in 2014, so the November 11 game will be the first tim e he’s seen the rivalry in person. “I’ll be pretty excited, and running around MAPFRE making sure everything is going smoothly and that it’s the best possible experience for the fans,” he said. The world’s game has taken root in Columbus, and Loughnane sees the potential for more growth. “Columbus has aspirations to grow into a city with a higher international profile and become even more multi-cultural and more attractive to millennials, and we think soccer is uniquely qualified to help Columbus grow into this 21st Century version of itself,” Loughnane said. Soccer (or football in much of the rest of the world) is the most popular sport in virtually every country across the globe and is called the world’s game for a reason. The MLS and Crew SC are about as multi-cultural and multi-national as you can get. The Crew SC has players from 10 countries: United States, Cameroon, Sweden, Argentina, Democratic Republic of the Congo, Costa Rica, Norway, Panama, Guatemala and Ghana. Crew SC is working hard to continue to grow and offer more perks for fans. “Ever since Anthony Precourt bought the team in July 2013, we’ve undergone a significant transformation,” Loughnane said, clicking off some of the changes: infrastructure improvements to the stadium and training facility; an increased investment in salaries for coaches and players; MAPFRE becoming the naming sponsor of the stadium; regular-season and playoff attendance records; improved food and beverage options. The team even changed its brand, and is now Columbus Crew SC. “That shows Anthony’s commitment to the city,” Loughnane said, adding the club has a Columbus-themed uniform that incorporates the city’s flag in its design. “We’re the first professional team that’s takes inspiration from its city’s flag like that,” he said. Notes: U.S. Soccer has not yet announced the time of the November game. It will be broadcast on FS1 and Univision. *The normal capacity for MAPFRE is 19,886. It will be about 24,500 for the Mexico game. *Tickets will go fast. Really fast. Crew SC 2017 season tickets holders will be able to participate in a preferred purchasing program. U.S. Soccer has yet to announce when ticket sales will begin. *A total of 12 Crew SC players have played for their country’s senior international team.